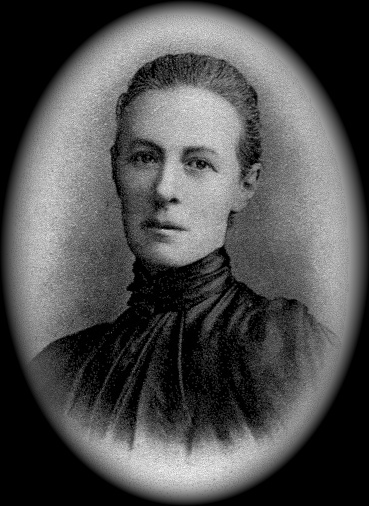 Lilias Trotter served her Lord in Algeria from 1888 to her death in 1926. Lilias, born to a wealthy family in England, first applied to a missions organization but was rejected because of poor health. So she went on her own as a single woman of 34 with two friends, all women of independent means. Her life was poured out in love in a very resistant culture. She found a way to befriend women by ministering to children with all types of classes. But over the course of her life, she saw again and again new followers of Christ falling away because of family pressure, sickness and opposition. Near the end of her life as she looked back over years of struggle with only small evidence of results, Lilias wrote these words, which have profound implication for all who desire to see the gospel flourish in unreached peoples. It is in the first breaking down of Pharoah’s authority that I believe we have failed. “First bind the strong man” has been an ignored counsel. We have gone straight to the task of “spoiling his house” and it is but little spoil that we have carried away, with the “strong man” of the powers of darkness resisting every step and pursuing the fugitive. It is with these powers that we need to deal, stretching out the rod of faith higher and higher from the dust of the earth to the very throne of God. At this point, judgement crashed down and shattered the last resistance. In a small booklet called Vibrations, Miss Trotter told of a day when the wall of her house had suddenly without warning, fallen inwards. She had sent for a builder to repair it but he first asked to investigate the cause. On returning from his exploratory trip outside, he explained that the kneading machine in the Baker’s shop next door had been vibrating against her wall every night for twenty years, gradually weakening the structure. Every stroke of the seesaw-like machine had done its work, but only the last had brought about the destruction. She believed with all her heart in that vibration of prayer that would gradually but insistently weaken the solid front of Islam. For forty years she did her part and died content, and we who follow have sought to carry on that quiet rhythm. Already there are those cracks in the wall of which we may not speak, but she knew and we know that not one vibration is lost. Every one does its work and we cannot tell how soon or how late the great barrier will crumble. May God grant us the patience to live in faith and hope and, if necessary, to die not disappointed, because: The vision is yet for an appointed time. It hastens toward the goal and it will not fail. Though it tarries, wait for it; for it will certainly come, it will not delay. 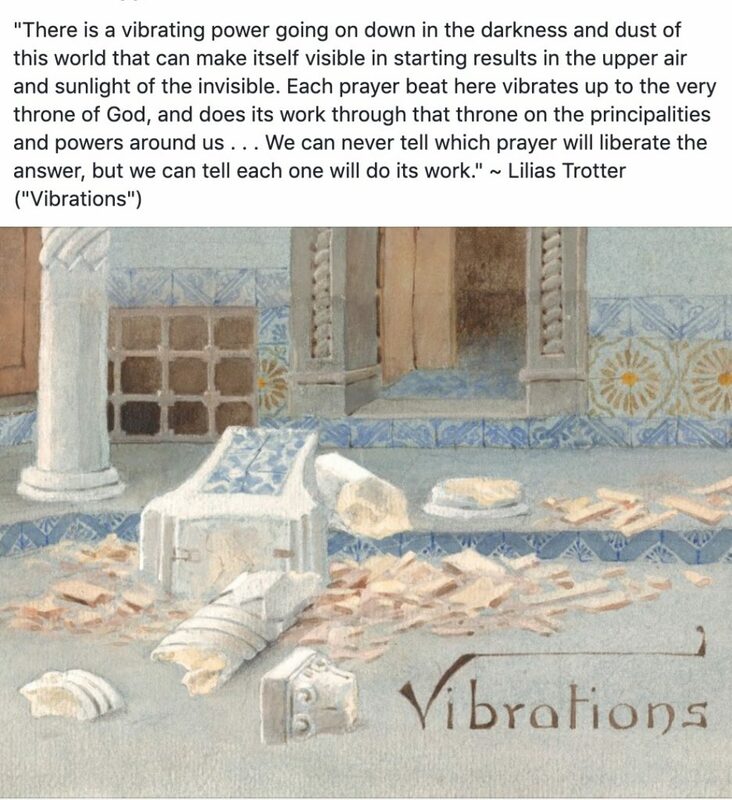 Here is one of her illustrations combined with a quote from Vibrations. These quotes are from Until the Day Breaks: The life and work of Lilias Trotter, Pioneer missionary to Muslim North Africa by Patricia St John (page 194 and 221). Unfortunately, this book is out of print. 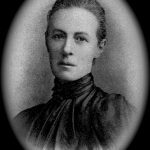 You can learn more about the life and ministry of Lilias from a more recent biography: A Passion for the Impossible: The Life of Lilias Trotter by Miriam Rockness.